Mandalay Entertainment chairman and CEO and Golden State Warriors (GSW) executive chairman and co-owner, Peter Guber, will be coming to the Philippines on March 20 as the featured speaker in ANC, the ABS-CBN News Channel’s Leadership Series at the Sofitel Philippine Plaza Manila. The media and sports mogul will talk in front of the country’s business executives, sports and entertainment industry leaders, and members of the academe about his experiences as an executive and entrepreneur in various industries. Prior to founding Mandalay Entertainment, Guber was chairman and CEO of Sony Pictures Entertainment, chairman and CEO of Polygram Entertainment, Co- Founder of Casablanca Record & Filmworks and President of Columbia Pictures. Guber produced or executive produced (personally or through his companies) films that garnered five Best Picture Academy Award nominations (winning for Rain Man) and box office hits that include The Color Purple, Midnight Express, Batman, Flashdance, The Kids Are All Right and Soul Surfer. In addition to his ownership of the Golden State Warriors, Guber is an owner of the Los Angeles Dodgers and an owner and executive chairman of Major League Soccer’s Los Angeles Football Club (LAFC). He is chairman of the Strategic Advisory Board and an investor in NextVR. Guber is an owner and co-executive Chairman of the new esports ownership group, aXiomatic, which purchased the controlling interest in Team Liquid, one of the most successful global esports franchises. Guber is also a member of the University of California Board of Regents and has been a professor at UCLA for 40 years. Guber, the #1 New York Times’ best-selling author of the business book “Tell to Win,” is the third featured speaker in the ANC Leadership Series. In 2016, ANC brought Virgin Group founder Richard Branson in the Philippines, followed by former US secretary of state Madeleine Albright in 2017. 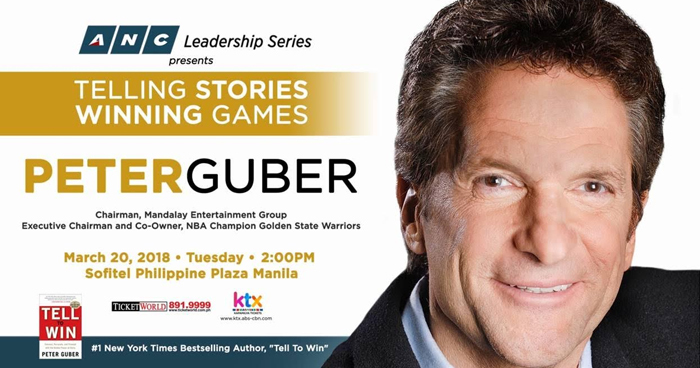 Watch and learn from Media Mogul and Sports Owner, Peter Guber as he talks about “Telling Stories, Winning Games” at the ANC Leadership Series, moderated by ABS-CBN news and sports anchor TJ Manotoc, on March 20, 2 pm, at the Sofitel Philippine Plaza Manila. Tickets are priced at Php 20,000, and Php 10,000. For inquiries and reservations, visit www.ktx.com.ph or call TicketWorld at 8919999 or log-on to its website at ticketworld.com.ph. For news and information, watch ANC, your news channel, your partner on cable. Watch ANC in high definition on cable on ANC HD. You may also visitnews.abs-cbn.com/anc or follow @ANCalerts on Facebook and Twitter.